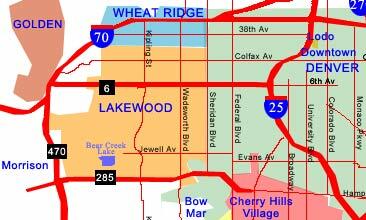 The city of Lakewood, Colorado, located just west of Denver, is nestled against the foothills of the Rocky Mountains. The community is served by five major highways, including Interstate 70, Colorado 470, and U.S. Highway 6, which provide a direct route to Denver, Boulder and the mountains. Lakewood has over 1200 acres and 85 sites of City-owned formally developed and undeveloped parkland. The people who live and work in the Lakewood area have an abundance of recreational opportunities year round. Our location puts us within minutes of the mountains to the west, the City of Denver to the east and the City of Boulder to the north. In winter, the Rockies offer skiing in its most challenging forms. In less than an hour and a half, you can be at world renowned downhill ski areas. Cross country skiers may choose to try their skills at these areas as well, but cross country skiing is available nearby. In summer, the mountains offer fishing, backpacking, and camping in glorious settings that rival any scenery in the world. Trails through Roosevelt and Arapahoe National Forests provide days of peace and quiet in which to discover the magnificence of the Rockies. Jefferson County took the name of the third U.S. President, Thomas Jefferson, master statesman, architect and writer. The need for an organized local government began in the late 1850s when droves of gold-seeking settlers came West. In 1858, when gold was discovered in the Rocky Mountains, there were fewer than 200 settlers in the area. An influx of nearly 35,000 people arrived two years later, lured by the glitter of gold. The county was formally organized in 1861 by the Colorado Territorial Legislature. The history of Jefferson County is rich in Western lore. The county was home to the original capital of the Colorado Territory and boasted gold diggers, cowboys and villains among its residents. The Pikes Peak Gold Rush of the late 1850s brought the first flock of settlers to the county. Reports of gold in the streams along the Front Range enticed prospectors to the area, and soon after coal was discovered near Coal Creek. By 1859, enough people lived in the area to merit the establishment of Golden City as well as other long-vanished towns, such as Arapahoe City and Golden Gate City. In 1861, President James Buchanan signed a bill creating the Territory of Colorado. The territory had 17 counties, including Jefferson County, and Golden City was the capital. In the next 20 years, the county became home to the first railroad in Colorado as well as to Coors Brewing Co. and the Colorado School of Mines. Traces of the Wild West lingered, however. After being released from jail, alleged cannibal Alferd Packer settled in a cave here, and legendary Western showman Buffalo Bill made the county his final resting place. Alameda 1255 S. Wadsworth Blvd. Water sports rolex watches uk watches are divided into replica watches several levels which, respectively, on replica watches uk behalf of what kind of waterproofing uk replica watches effect.